Metal has been used for the construction of buildings and homes for over 2500 years! At United States Seamless, we are committed to building responsibly by respecting our environment through the use of energy-efficient materials and green-friendly products. Let United States Seamless help make your environment a little more green – our products will not only save you money on energy costs, they also make your home a safer place to live and breathe. Many of the products we carry are energy-efficient, and we have made a commitment to continue to carry products that are long-lasting, reduce energy costs in your home and help to reduce strain on our environment. Metal products have a greater resistance to wind, hail and wind-driven rain. Made of recycled content and is 100% recyclable at end of product life. Steel is the most recyclable building material in the world. Seamless steel siding substantially reduces moisture intrusion, which can cause structural deterioration. Metal products are long-life, durable options. Easy to clean and virtually maintenance-free. Since steel siding does not require painting, staining or caulking, no harmful solvents are released into the environment to maintain it. As a result, steel siding can earn points in leading green building certification programs. Our exterior paint finish will give your home's exterior an easy-to-clean, stain-resistant finish. A simple rinse with your garden hose is all you will need to do to keep your siding looking fresh and clean all year long. 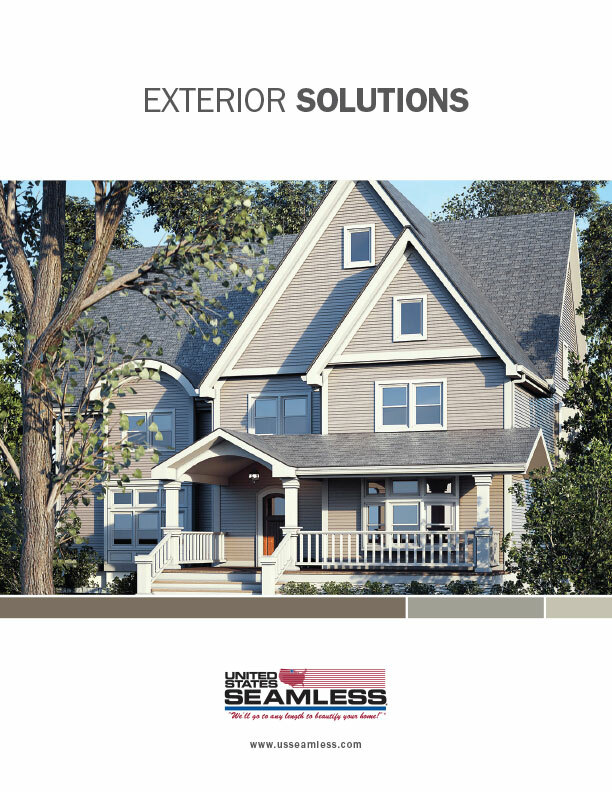 With United States Seamless siding, you will free yourself from high-maintenance exteriors. Best of all, you will never have to paint or stain your home again. The most effective way to achieve better energy efficiency is through an integrated "whole house" approach with the use of ENERGY STAR products and enhancements. With ENERGY STAR products, your home will be more energy efficient and save you money while protecting the environment. Our exterior coatings are ENERGY STAR compliant and are enhanced with Cool Paint Technology™ (CPT). CPT is a technology developed for NASA's space shuttle program that uses infrared reflective pigments in the paint to cool the surface. In exteriors, CPT is used to improve the energy efficiency of homes by reflecting solar and thermal radiation. Heat Deflection: United States Seamless exterior collections receive a Very Good (4) to Excellent (5) rating. PVC-coated material absorbs heat (0-1) rating. Homeowners need choices, not limitations, in order to turn their dreams into reality. Along with our extensive color palette of endless color combinations, we’ll also provide you with an array of profile options that will define the characteristics of your home. Our color-perfect finishes coordinate with our soffit, fascia, rain carrying systems, architectural trims and accessories to complete your design vision and enhance all architectural styles – without the maintenance. Choose from dozens of decorative options like window cladding, door surrounds and headers, banding and baseboards, able accents and shutters.